While there is a plethora of content on the web about peak oil, I can’t seem to find many charts that track the current medium-term trends in global oil supply and price (a lot of the reports go into great detail about explaining short-term trends, or show long-term trends without the most recent data). So here is an attempt at some medium term analysis of the data (if anyone can suggest other/better sources of such analysis I’d be pleased to hear about them). The first chart uses International Energy Agency (IEA) quarterly data on world oil supply until 2011Q2, projected demand for the last two quarters of 2011 (as at September 2011), together with the average WTI oil price in $US for each quarter. The second chart simplistically looks at the relationship between price and demand/supply for each quarter 2000 to 2011Q1. 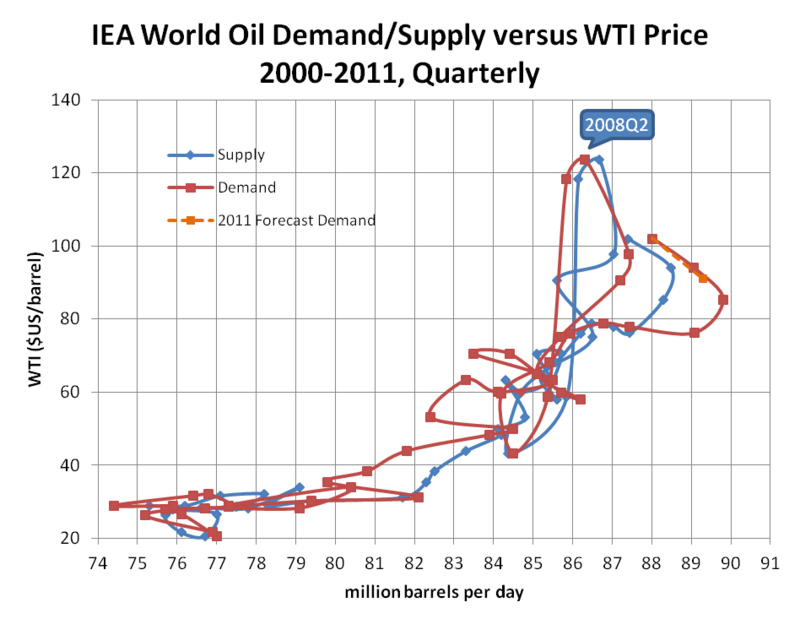 I’ve also added forecast 2011 demand for remaining 2011 (assuming a $91 price). Note: there are small differences between supply and demand each quarter due to stockpiling etc. Yes this is a very simplistic representation of world oil markets (it doesn’t adjust for inflation or global exchange rates), but I think it is still interesting. You can see that there are differences between quarterly demand and supply as the red and blue lines don’t always overlap. For example, according to the data, supply exceeded demand in the quarters where prices peaked, but then demand exceeded supply for the two previous quarters. World oil supply grew strongly between 2002 and 2005 and then was stuck around 84-87 million barrels per day (mb/d) until 2010. Supply grew to a new high of 88.5 mb/d in 2011 Q1, but then dropped in 2011 Q2. 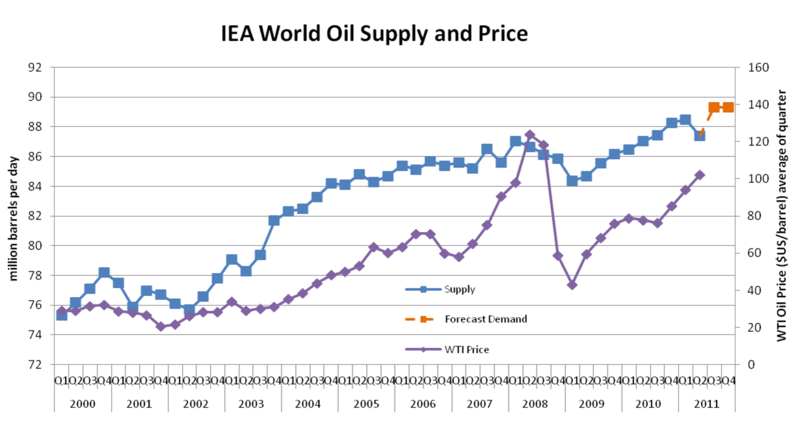 The September 2011 Oil Market Report suggests supply is now 89.1 mb/d. During 2007 and the first half of 2008, oil prices grew strongly while supply was relatively unchanged, suggesting a demand-supply crunch. After mid 2008, both prices and supply collapsed, around the same time as the global financial crisis hit. During 2009, prices almost doubled, while supply only grew a small amount (although a devaluing of the US dollar explains some of this). During the first three-quarters of 2010 supply grew but prices stabilised. But since 2010Q4, prices increased, even though supply reduced in 2011Q2. At the time of writing WTI oil was around US$91, and supply had increased again. Looking at the second chart, it appears we have broken through the 88 mb/d threshold without the same prices seen in 2008. It’s very hard to speculate, and I’m not particularly qualified. At present it appears oil prices have fallen with global economic conditions, supply has increased to a new high, and demand is also higher than ever. Will it be possible to continue to ramp up supply to meet the further increases in demand? The peak oil theory essentially suggests that new oil sources are harder to find and extract, that many existing fields are in unavoidable production decline, and so it is getting harder just to maintain current supply levels with new fields, let alone grow production overall. And harder still to grow production without increasing prices. We’ve seen some supporting evidence in 2008, but conflicting evidence in 2010. That might have something to do with exchange rates. Oil prices fell in 2010Q3, but the US dollar was strong in mid 2010. Probably need more thorough analysis than what I have done. But the data is what it is. And all will be revealed in time. But what will transport investors assume? Increasing global supply without significant price growth over the next 30 years does not look like a particularly safe assumption! But I fear it is the default assumption. You are currently browsing the archives for the Energy security category.